A focus on total cost of ownership will require integrators to quantify the efficiencies offered by AV technology in the new office environment, via the IP address, observed Julian Phillips of Whitlock. Then “every aspect of input/output and customer outcome can be measured, managed, and optimized to deliver far greater efficiency than we deliver today.” The corporate workplace is undergoing a transformation, due in large part to a combination of influences such as cost, collaboration, convergence, and the cloud. What will the future office look like, and what part will AV integrators play in its evolution? “The workplace is not evolving, it’s being revolutionized,” according to Julian Phillips, executive vice president of Whitlock. “More businesses are moving towards ‘European style’ open plan office environments to make better use of space and create a more collaborative working environment. This drives a need for more informal meeting spaces. One in-room collaborative solution is Barco’s ClickShare, he said. Current trends also include implementation of distributed antenna systems to ensure facility-wide wireless access, and cellular reinforcement systems, especially in high-rises, he added. “The other really interesting trend is that BYOD is being tied to you as an individual, so that when you come into a particular space that device can be utilized to control the room,” observed Anthony Cuellar, vice president of Diversified Systems. While authentication and security issues remain concerns for the IT department, NFC and RFID technologies are enabling individuals’ devices to be automatically recognized and logged into workplace networks. Moving applications onto the cloud certainly offers costs efficiencies. “Instead of building large, very expensive, high power-consumption data centers in the corporate environment, they’re moving a lot of that equipment out to the cloud through hosted co-location facilities or off-site data centers,” said Shen. In fact, modern corporate building systems may be highly converged on an IT backbone. “Through an intelligent building management system and customized control interface you can control not only your IT network, but also your AV network, and other building functions like HVAC, lighting, and security” he said. So how can AV integrators best sell their clients on the ROI of these new technologies and services? “ROI has been difficult to calculate because it has been virtually impossible to calculate ‘gain,’ because we don’t effectively measure outputs and outcomes from AV technology,” Phillips acknowledged. Happily, there is a way for integrators to quantify the efficiencies offered by AV technology in the new office environment, via the IP address. “Every single AV asset needs to have one and it needs to sit on and be managed on the network,” said Phillips. “Once this is achieved every aspect of input/output and customer outcome can be measured, managed, and optimized to deliver far greater efficiency than we deliver today. What is the most outrageous vision of the office of the future? 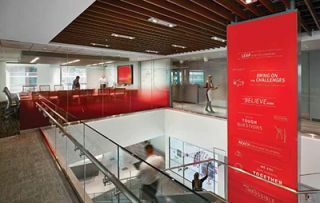 Sound masking systems will likely be a critical part of the office of the future, where open office plans will require creation of comfortable collaborative and private environments. The growing popularity of open-plan office environments will likely trigger increasing demand for sound masking systems, which are designed and installed to create more productive environments with greater acoustical comfort. The systems work by raising the ambient background sound in spaces, masking speech, and thereby creating comfortable collaborative and private environments that can coexist. Speakers in a system that produce a gentle “hush” sound are typically installed within the plenum (the space between the ceiling and the deck above) or in the acoustical ceiling tile facing downwards towards the occupants. However, a system that is not properly installed may put those underneath the system at risk. Sound masking systems may be a risk for occupants and first responders if the speaker systems themselves are not secure. Building code, and just good installation practice, says that “wires and speakers must be secured” to the deck. We have seen too many speakers cut into the ceiling tile and installed without proper methods—no wire or chain securing the speaker to the deck or tile bridges (a device that allows the weight of the speaker to be secured by the ceiling grid instead of the acoustical ceiling tile). Furthermore, and unfortunately, many installers are either unaware of the code or choose to take their chances without putting in a proper hanging system. These installers are taking a risk with the building inspectors and the safety of the occupants. Ignorance or unethical business practices based on securing the lowest bid should not put occupants in harm’s way. The National Electrical Code (NEC) spells out the requirements as it relates to installation of equipment and wiring regulations. Based on the NFPA 70 NEC 2011 Edition, generally, the rule for supporting electrical equipment is that the equipment must be ‘securely fastened in place.’ This phrase means not only that vertical support for the weight of the equipment must be provided but also that the equipment must be secured to prevent horizontal movement or sway. Sections 300.11(A)(1) and (A)(2) are quite similar. These sections clearly prohibit all types of wiring from being attached in any way to the support wires of a ceiling assembly. Unless ceiling grids are part of the building structure, they, too, are prohibited from furnishing support for cables and raceways. The general requirement of 334.30 is that the cable be secured. Simply draping the cable over air ducts, rafters, timbers, joists, pipes, and ceiling grid members is not permitted. Safety of building occupants is not a consideration, it is a requirement. The next time you are looking at an audio or sound masking system where the speakers are being installed in the ceiling tile, ask the question: “Are the speakers and wire of the system going to be properly secured?” Make certain this is part of the specification and scope. People matter and safety is everyone’s business. What still demands a hard-wired connection, besides security and encryption applications, in an increasingly wireless office?